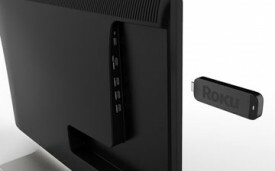 Streaming media player company Roku recently announced the new Roku Streaming Stick that will turn compatible TV sets into robust Internet-connected devices. The Roku Streaming Stick packs the power of a Roku player into something about the size of a USB flash drive. It plugs into the HDMI port on your TV and offers up the entire Roku experience, including access to services like Netflix,Pandora, Crackle and Hulu Plus. What’s the advantage of a stick over a set-top box? Well, for one thing, a stick takes up less space. It also eliminates the need for an extra remote control, integrating more natively with the regular TV experience. The one caveat — and sadly this is a major caveat — is that the Roku Streaming Stick requires television to have MHL-enabled HDMI ports. MHL — or mobile high-definition link — is a proposed standard that allows a device to offer 1080p video and digital audio while also charging a connected device. So far, a few HDTV sets from Toshiba and Samsung are equipped with MHL, and Roku says more MHL-enabled devices will appear at CES. Here’s the problem we see with this approach: The value proposition of the Roku Streaming Stick is ostensibly to bring connected support to HDTVs that lack (or have limited) support for streaming services. However, if a television is going to ship with MHL support, chances are it is also going to have Wi-Fi, support for Netflix and a handful of other streaming options . While television sets lack the connectivity of say, a Blu-ray player (even low-end Blu-ray players offer a bevy of connected options), that’s quickly changing. Roku does mention shipping replaceable Roku Streaming Sticks with new HDTVs and this seems like a more robust business plan. After all, if a consumer can buy a connected television set that is, in essence, “upgradeable,” that might have real value. Roku hasn’t announced pricing or availability, but says that the Streaming Stick should be in range of its other set-top boxes. Best Buy has already signed on to support the Roku Streaming Stick with future Insignia television sets.